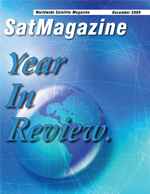 Welcome to the annual YEAR IN REVIEW issue of SatMagazine. The companies who participate in this annual edition provide readers with their particular takes on their challenges and successes encountered during 2009 and, in some cases, offer us a preview of 2010 as far as their intents and purposes are concerned. More than a year ago, iDirect and Panasonic Avionics partnered to deliver a new, in-flight broadband system. We checked in with David Bettinger, iDirects Chief Technology Officer and Senior Vice President of Engineering, to learn the latest information more regarding their joint efforts. InSight  NSR, In-Flight Satellite Connectivity... Are We There Yet? Ondas Media, the would-be European pay-radio service, has signed up the U.K.s Jazz FM to its planned service. Ondas Medias strategic plans are also rapidly firming up. In November Ondas, complete with some of its key automobile, broadcast and technology partners, participate in financial road shows in Munich and Paris. I am stunned at the level of support, and interest being shown, said Dave Krueger, CEO at Ondas Media. That enthusiasm extends to Ondas car manufacturing partners who are stressing to investors their views of the importance of the Ondas plan. Its a common message and that it is time to get started, said Krueger. In the Maritime VSAT market, the two most attractive segments are Containerships and Tankers. Both classes of vessels owners see significant value in fixed priced Broadband, and together they represent a potential market of over 14,000 vessels. In fact, other then Bulk Carriers, they are the only segments where high concentrations of vessels can be found under single owners or managers. 2009 was marked by the deepest economic crisis of the last decade, with its roots in the financial and early phase of the real estate crisis in 2007 and 2008. While a number of observers note signs of recovery, the economy remains fragile and uncertainty persists. It used to be video distribution that pretty much ruled the teleport industry. But over the last few years, niche markets and value-added services have changed the landscape, and with it, expectations for this US$13 Billion sector of the global satellite communications marketplace. Several weeks after I helped submit a proposal for the first funding round for the American Recovery and Reinvestment Act (ARRA) Broadband Stimulus, a moderator on a SATCOM webinar for which I was a panel participant asked me to respond to a statement from a state legislator that SATCOM was not the way to go in disseminating broadband to the unserved and underserved areas of the nation. IDCs Tiernan products will be used by the Vietnam Telecom International (VTI) DSNG project for the upgrading and expansion of DSNG, which will be used for Asian Indoor Games in the fall of 2009. The advanced, compact DSNG allows simultaneous HD & SD transmission while having lighter weight and less equipment. The win resulted from a well designed solution with strategic planning from Tiernan and strong local presence and technical competence of OSB. The project involves several parts of the DSNG such as high power amplifiers, encoders and decoder. Satellite operators are preparing the massive development of mobile TV and mobile broadband services. The companies who participate in this annual edition provide readers with their particular takes on their challenges and successes encountered during 2009 and, in some cases, offer us a preview of 2010 as far as their intents and purposes are concerned.